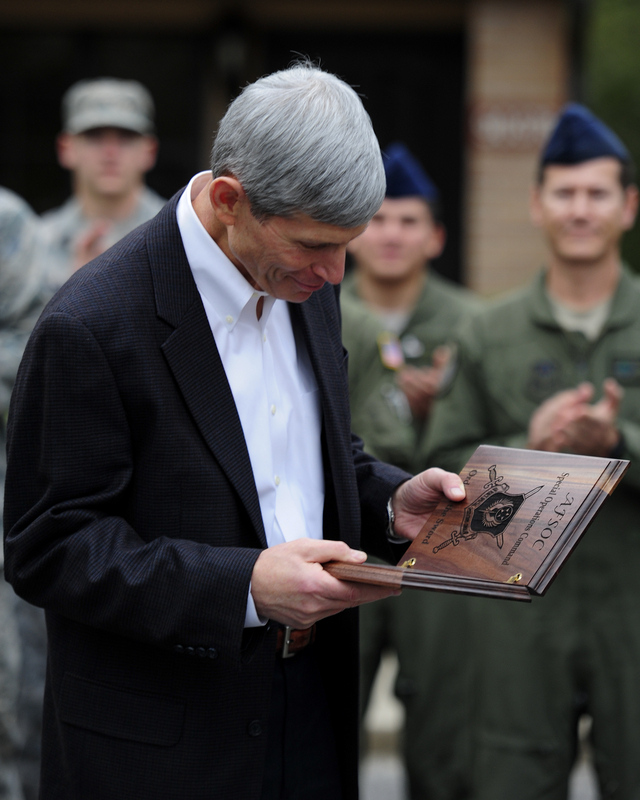 Retired U.S. Air Force Gen. Norton Schwartz, former Chief of Staff of the Air Force, reads his Order of the Sword nomination plaque. Photo by Airman 1st Class Christopher Williams. The award recognizes officers “for conspicuous and significant contributions to the welfare and prestige of the Air Force enlisted force,” according to an Air Force news story. To accept the nomination, Schwartz and his wife Suzie traveled to Hurlburt Field, Fla., where 300 airmen lined the road along the distinguished visitor quarter’s parking lot, the news story says. Schwartz will be formally inducted into the Order of the Sword on Feb. 1 at the Emerald Coast Conference Center in Fort Walton Beach, Fla.